Growing up in the urban areas of Korea, he says he had few chances to look at the night sky and wonder about the mystery of the universe. "I was more interested in science fiction where heroes and heroines wandered around the universe." To stay awake late at night during observing runs, Myungshin says he consumes lots of caffeine from coffee, cokes, and chocolate. If he gets bored or needs to rest his eyes, he will step outside to watch the night sky or look for interesting creatures. As a kid, Myungshin says he thought about becoming an artist and still likes painting. He says his other hobbies are hiking and watching movies. "Meng-gu" is his 6-month old cat's name. 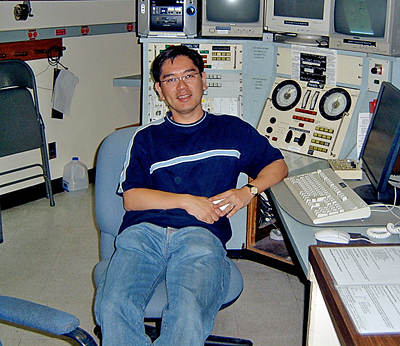 Most of the time, Myungshin says he is analyzing data he collects from observing runs, writing papers and preparing for his next observation. "Making new discoveries always excites me," he says. "Seeing my students finish PhDs makes me happy too."